While every city has in-demand areas with high prices to match, says national real-estate brokerage Redfin, Mallard Creek and other neighborhoods on this list offer that rare mix of attractive homes costing less than $294,000. The report includes the top 10 hottest affordable neighborhoods in cities served by Redfin nationwide, plus the top three neighborhoods in each of those markets. This report tracks year-over-year growth in listing views and favorites and incorporates Redfin agent insights to see which neighborhoods are growing in popularity, but with a price cap of $294,000, the median home price across all markets Redfin serves. The median home price in the Charlotte market is $240,000, Redfin says. 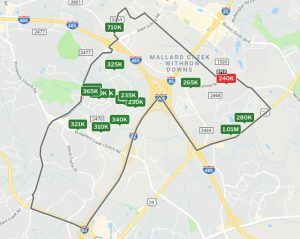 Other Charlotte neighborhoods making the list for Charlotte’s top three hottest affordable neighborhoods are Sunset Road (off of Beatties Ford Road in northwest Charlotte) and Madison Park (between South Boulevard and Park Road in south Charlotte).